Yes, the little guy is in full pull-books-off-the-shelves mode, and I’m at a loss as to what to do! I’d cleared the bottom shelf, but now he can reach the next one (and not just on this bookcase). This seems like an unsustainable precedent. This entry was posted in blogging, books, fiction, WordLily and tagged maisie, photograph, Sprout. Bookmark the permalink. Oh, no! When I found out I was unexpectedly having my third child, THIS is one of the things I most dreaded going thru again! Do you just deal? Reshelve every day? How do you come to grips that none of your books will ever been in good condition again? Also, how long does this last? I’ve got friends saying they’re still working on it with their 12 year olds. So cute! I think he’s trying to help you! I remember that stage well! 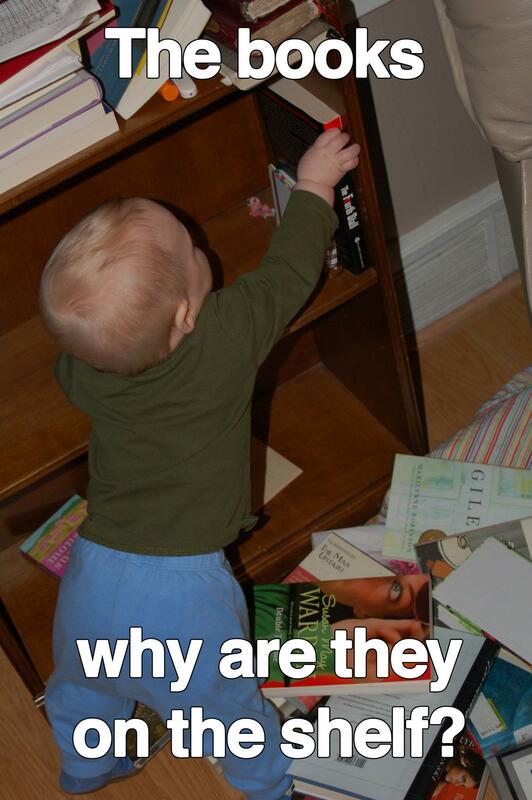 We put board books on the low shelves and let them have at it. Ben, especially, loved to sit on the floor surrounded by all his board books and turn the pages, pointing to words and pictures and babbling nonsense words. aw he’s getting so big! I remember that phase!! Books, CDs, food storage containers, pots and pans, clothes in the changing table; anything that could be pulled down was. It was an adjustment for me; we have a lot of CDs, and I kept them in alpha order before the babies – and since they’re not babies anymore – but during the phase, I had to deal with the fact that “off the floor” was good enough. We didn’t come up with any better solution and just kept clearing shelves until he got bored of trying and old enough to be into other things. Same with CDs. And with kitchen stuff. Used to drive me mental!! Too cute. Gage still does this at 2 although he is more selective with what he pulls off so there’s not as much to clean up. He seems to pull the same books consistently. He must really want me to read them!